T-shirt yarn, cotton chunky yarn for crochet bags, rugs and baskets. Textile fabric, recycled t-shirt yarn. Beige powder tshirt yarn. St Valentines Crochet basket with heart pattern in PDF with crochet instructions. 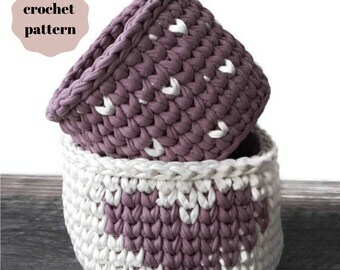 Crochet bowl pattern, easy DIY from bulky tshirt yarn. ***If you think that your shipping cost is unreasonable please contact me and we'll figure out a better option. T-shirt yarn, textile chunky yarn for crochet bags, rugs and baskets. Jersey yarn, ribbon tshirt yarn. 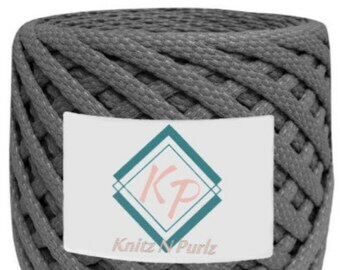 Granite grey t shirt yarn. T-shirt yarn, textile chunky yarn for crochet bags, rugs and baskets. Jersey yarn, ribbon tshirt yarn. 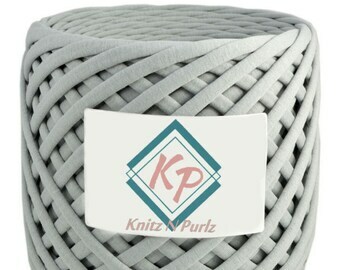 Light grey t shirt yarn. T-shirt yarn, cotton chunky yarn for crochet bags, rugs and baskets. Textile fabric, recycled t-shirt yarn. Grey London tshirt yarn. 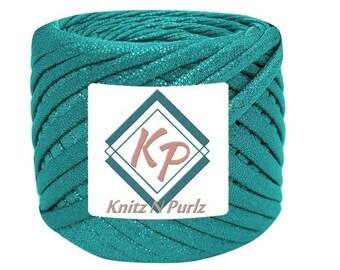 T-shirt yarn, textile chunky yarn for crochet bags, rugs and baskets. Jersey yarn, ribbon tshirt yarn. Cream t shirt yarn. T-shirt yarn, cotton chunky yarn for crochet bags, rugs and baskets. Textile fabric, recycled t-shirt yarn. 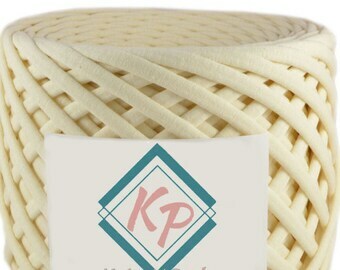 White coco yarn. Love the tshirt yarn! Great quality. The shop owner is very nice and always responds to my questions. Oh, and fast shipping. 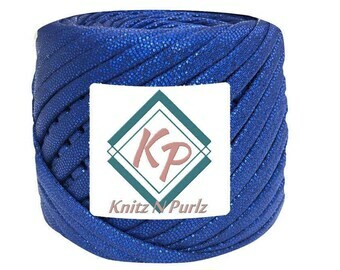 Macrame cotton cord, macrame supplies for DIY macrame projects. 5 mm Cotton rope for crochet basket, rug making and wall hanging string. 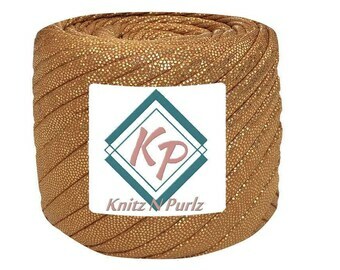 New metallic yarns are now available at the shop. 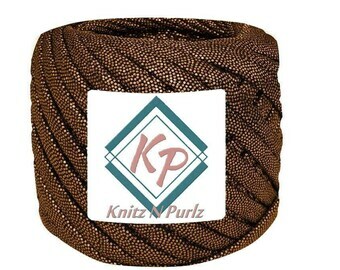 Textured T-shirt yarn, textile chunky yarn for crochet bag, rugs and baskets. Jersey yarn, ribbon tshirt yarn. 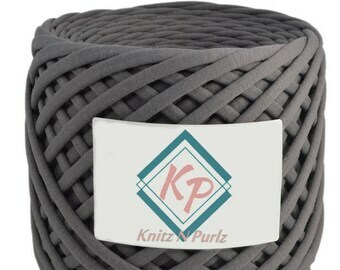 3D granite grey t shirt yarn. Constant restock on the most popular colors! Enjoy the process and have fun! My name is Irina and I am a maker + face behind KnitzNPurlz. I am a mama to 2 boys, who drive me bananas sometimes, but I love them more then anyone can imagine + I have hubby by my side. I remember myself being 5 or 6 years old in hot summer day trying to knit my first stitches, it was hard and hot and my hands was sweating from wool, but nevertheless I loved the process. That was my first scarf, sloppy, not even with many many mistakes on it. Since that age my knitting skills improved and many hats, shawls, gloves followed that scarf. That's why and how I am here, creating unique items and share it with you! Be it for yourself or a gift for family member, or a friend either way my products will give you or your loved one a cherished memento that will last for years to come! For my fellow knitters and crocheters I searched the best high quality materials around the globe and gladly share my patterns with you, so that you can fulfill your passion and needs without warring where and how to get #allthethinsyouneed. machine washable, air dry, no ironing. Some of the items sells out fast, what can you do? Please convo me and I will try to accommodate your request.